The denizens of Twitter, Facebook and the rest of the social Web are a sharp group, generally speaking. You can learn a lot about yourself, your brand, and your products and services by listening to the desires of your fans and your community. I crowd sourced my facial hair, and kept my beard. Del Monte crowd sourced product development and made dog snacks that look like breakfast. Now, CrowdCampaign has created a nifty Web app that enables quick and easy collection of fan and friend opinion, including tight Twitter integration. CrowdCampaign was created by the guys at Social Collective (who built the killer pre-conference interactive functionality for SXSW and other events). 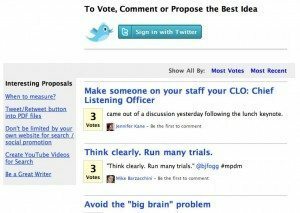 It allows you to harness crowd participation in two ways: the creation of proposals (ideas) and voting on those proposals. The best aspect of CrowdCampaign is its stunning ease-of-use. You pick a subdomain (http://yourname.crowdcampaign.com) and click a button. Sign in with your Twitter username and password, and presto! You’re up and running. You then customize your page headline, instructions, background image, hashtag, etc. All of this should take about 5 minutes. Then, just publicize your new campaign on Twitter and elsewhere, and watch the ideas and votes roll in. The tool includes a viral component whereby voters can tweet their participation, growing awareness of the campaign. I used CrowdCampaign to help craft the 33 hot social media and digital marketing tips from the MarketingProfs Digital Marketing Mixer conference (see the sample CrowdCampaign here). 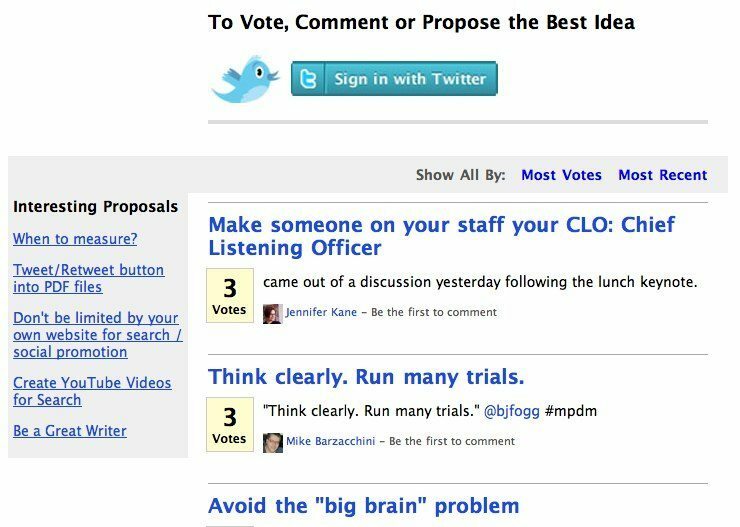 Other uses for CrowdCampaign include simple contests, idea generation among groups, and pre-conference voting on speakers and sessions. The folks at TechCocktail in D.C. used CrowdCampaign to give away an association membership to a worthy startup, as voted upon by their community. Well-done. Pricing for CrowdCampaign is based on the number of ideas that can be proposed, and the length of time the application is online. Very simple, week-long programs are free. Annual, enterprise-class versions are $995/year. Most people will want the $95-$395 package, an excellent value for a turn-key crowd sourcing option. Remember, the first 25 folks that use the “CandC” promo code, will save 50%. What have you crowd sourced? What could you crowd source?